In 1908 Grahame retired from his position as secretary of the Bank of England. He moved back to Cookham, Berkshire, where he had been brought up and spent his time by the River Thames doing much as the animal characters in his book do--namely, as one of the phrases from the book says, "simply messing about in boats"--and wrote down the bed-time stories he had been telling his son Alistair. In 1909, Theodore Roosevelt, then US president, wrote to Grahame to tell him that he had "read it and reread it, and have come to accept the characters as old friends." The novel was in its thirty-first printing when playwright A. A. Milne adapted a part of it for the stage as Toad of Toad Hall in 1929. 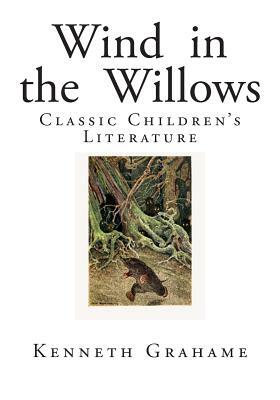 In 2003, The Wind in the Willows was listed at number 16 on the BBC's survey The Big Read. With the arrival of spring and fine weather outside, the good-natured Mole loses patience with spring cleaning. He flees his underground home, emerging to take in the air and ends up at the river, which he has never seen before. Here he meets Ratty (a water rat), who at this time of year spends all his days in, on and close by the river. Rat takes Mole for a ride in his rowing boat. They get along well and spend many more days boating, with Rat teaching Mole the ways of the river. One summer day, Rat and Mole disembark near the grand Toad Hall and pay a visit to Toad. Toad is rich, jovial, friendly and kind-hearted, but aimless and conceited; he regularly becomes obsessed with current fads, only to abandon them as quickly as he took them up. Having recently given up boating, Toad's current craze is his horse-drawn caravan. He persuades the reluctant Rat and willing Mole to join him on a trip. Toad soon tires of the realities of camp life and sleeps-in the following day to avoid chores. Later that day, a passing motorcar scares the horse, causing the caravan to overturn into a ditch. Rat threatens to have the law on the motorcar drivers while Mole calms the horse, but Toad's craze for caravan travel is immediately replaced by a motorcar obsession.